Researchers at Michigan State University are creating a computer model to help make pasture dairy farming more sustainable. The project draws upon several research papers released in the past three months that discuss the environmental impact of livestock farms and how climate change affects them. They also address the challenges of moving cows from barns to pastures. Pasture-based livestock graze year round or seasonally. That’s different than in confined systems where the cows are housed and fed indoors for the majority of the year, said Melissa Rojas-Downing, an MSU doctoral student and one of the co-authors of the research papers. A central goal of the model is to help pasture-based farmers optimize milk production. It considers farm economics, water and energy use and carbon dioxide emissions. “We are looking at developing maps that show sustainable target milk production in different regions,” said A. Pouyan Nejadhashemi, a professor with the university’s Environmental Science and Policy Program and a co-author. On his office computer screen, Nejadhashemi pulls up a map of Michigan with 10 color-coded regions. Each color depicts the most sustainable level of milk production possible in these areas, taking into account local climate and pasture composition. The latter looks at the average ratio between certain grasses and legumes. “The ultimate goal is to give people a choice to either stay with what they already have and find what the most sustainable solution is or if they’re willing to change to what is the most sustainable solution for them,” he said. If you’re a farmer in the Saginaw Bay area, the model would take into consideration what types of grass and legumes make up your specific pasture in the region. It would look at the kind of equipment on your farm and whether it’s more conducive to confined or pasture-based dairy farming. Using historical and current weather data, the model would tell you what to expect regarding climate shifts, and whether it will harm your production. It would also look at how much energy is used to run your farm and how sustainable those practices are. After all this, the model would suggest several options to choose from, based on what is most sustainable, given these variables and your management preferences. The idea is not to dictate solutions to farmers, but to present choices that work for the farmer and the environment, Nejadhashemi said. To do that, the researchers built computer model of a representative dairy farm established using data from the U.S. Department of Agriculture (USDA) National Agricultural Statistics Service, pastureland distribution and surveys of Michigan farms. All of this information is then used to build upon the Integrated Farm System Model, a modeling system developed by the USDA. Researchers use three sets of data to test how climate change will affect the representative dairy farm. One set is historical data from 1985 to 2005. The other two sets consider climate scenarios based on projected greenhouse gas emissions between 2040 and 2060. And the model simulates various pasture compositions that the cows graze on. Put it all together and the model provides the most resilient options for dairy farmers with the best production outcome, Nejadhashemi said. The project focuses on Michigan, but Nejadhashemi said he hopes to expand it. “Our goal is to expand this onto the Great Lakes basin, and the reason is that 40 percent of milk production in the U.S. comes from this region,” he said. To better understand the Michigan dairy farmers who contribute to this 40-percent figure, the researchers turned to the experts at MSU Extension for advice and guidance. Harrigan noted that while pasture-based farms may yield lower profits due to lower milk production, the loss is offset by lower overhead costs because grazing farms don’t have to invest as much in feed, construction and maintenance of housing or expensive machinery. This trend towards grazing over confinement is corroborated by one of the research papers that came out of Rojas-Downing and Nejadhashemi’s research. “In the last couple of decades (farmers), are moving from industrial type of production to taking (the cows) more to the pasture,” Nejadhashemi said. But while opting for grazing may make fiscal sense right now, climate change presents severe threats to these farmers’ livelihoods as weather becomes more unpredictable and grasslands die out. For those just entering the profession, the risk to their farms will grow as time moves forward. Though concerning, Harrigan said he also found farmers are increasingly aware of the need for sustainable practices to offset the threats from climate change. “Young farmers are very well aware of that coming in,” he said. The project started with a survey of Michigan dairy farms by Rojas-Downing. The goal was to test the feasibility of using anaerobic digesters on pasture-based farms. Anaerobic digesters are typically used in confined systems to create renewable energy from organic waste, like methane from cow manure. Eventually, Rojas-Downing moved to the larger question of climate change’s impact on dairy farmers. Her interest derives from her experiences growing up in Costa Rica. “My grandfather has a farm, and he’s mostly sugarcane and rice, but all around that area you will see livestock mostly for dairy or beef,” she said. The researchers expect to begin applying their model in Michigan in the coming summer. They are also collaborating with researchers in Costa Rica and Colombia to test their model in those countries. 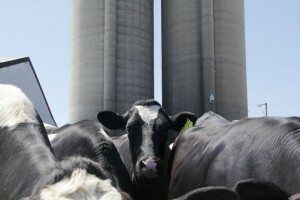 To study dairy farm sustainability – be they confined or put to pasture without considering the problems that manure is creating for the waters of the Great Lakes, especially Lake Erie, is incomplete and unrealistic. The meat and dairy industry has established a rule for soil phosphorous from manure of 150 ppm or more while commercial fertilizer is up to 40ppm soil phosphorous. Increasing legacy phosphorous in the soils is having an increasing impact on harmful algae in many watersheds. For those of us that drink and recreate in the water, land application of manure with excessive buildup of nutrients is unsustainable and cannot continue. It would be good if MSU looks into dairy manure and what can be economically done with it. The clash between manure and water is building, especially when Michigan has one of the largest hog farm processing plants under construction in Coldwater that requires 10,000 hogs a day. Along with the 800 jobs comes massive increases in manure – while Michigan gets the jobs, Ohio gets the POOP and Lake Erie gets more algae. In summary, this report on dairy sustainability fails to consider the cost of changes needed in manure management.